Perhaps I just haven’t found it yet, perhaps it has tried and died here already, but Phoenix really needs a late night, after the bars close, walk up hot dog stand. No frills, cash only, greasy griddle fried in butter all beef franks with warm buns. Serve them with fries, and a soda. I’m just a sucker for trotters and miscellaneous pig bits stuffed in a casing – a quick and dirty, one-handed meal. New York has this in Gray’s Papaya. A simple menu, cheap for anywhere in America – let alone New York, open 24 / 7 and a New York institution. 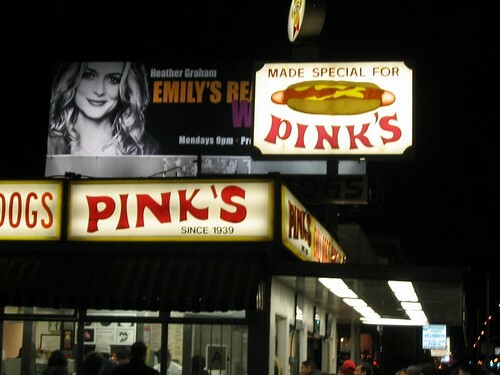 Los Angeles has Pink’s Hot Dogs. Located on the northwest corner of Melrose and La Brea, Pink’s has become an LA tradition. Open until 3:00 AM on weekends. The line can be long, it sometimes takes 2 hours to get to the order counter. Pink’s has a lot of imaginative selections on their menu, many of which are named after the Hollywood and Food Network moguls that have walked up to their counter over the years. My one and only experience at Pink’s was in December of 2005. The funny thing about the below snapshot is the billboard above Pink’s. It is advertising Heather Graham’s new ABC television show “Emily’s Reasons Why Not”. The show had the honor of being a “one and done”, cancelled 48 hours after its pilot aired on January 14, 2006. I think I waited in line longer than that show was on television! So Phoenix’s hot dog stand needs to be open late. It needs to be cheap. It needs to be a walk up joint. It needs maybe a dozen creative twists on a traditional dog. Maybe a “Philly Dog” should be one of them. I could very easily picture it on the menu at Pink’s. Look at the picture at the top of the post – and wing it! Get some grilled onions, peppers, and grated swiss cheese. Top it off with some mustard and chow down. So, if this hypothetical hot dog stand existed, where would you put it? Location, location, location! Thanks for reading Elliot. Well I think it needs to be close to some bars letting out after last call. Maybe near Mill Ave? Or Old Town? 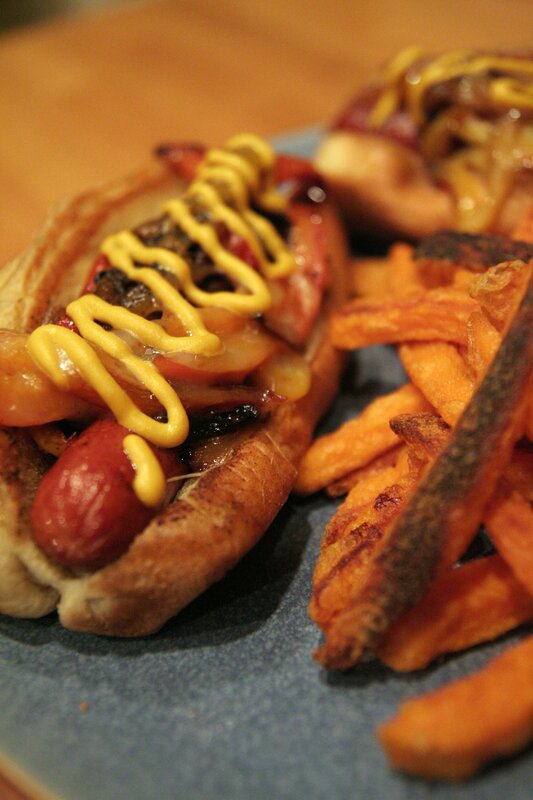 We got a better one that those…Trust us, we’ve eaten a TON of every type of DirtyWaterDogs in our career. I’m not a hot dog guy. I’ll eat a polish sausage or a brat but, I don’t often hanker for a straight up dog unless maybe I’m at a ballgame. That said, I’ll eat anything after some binge drinking …. SF has a lame attempt at a real dog stand. It’s called What’s Up Dog? I just like the name really. We have a trend kicking up here – late night kimchi burritos. They’re legit. Maybe PHX will get a kimch burrito stand first? kimchi burritos – that actually sounds pretty good. J and I are heading out to Seoul, SK, in about 5 weeks. Looking forward to some street food.